International immersive conference returns to RDS Dublin on Friday, May 10th. Immersive technologies ( Augmented, Virtual and Mixed Realities ) are finally on the cusp of a breakthrough in adoption at business and enterprise level in Ireland. This is reflected in a number of significant developments in relation to Government prioritisation of the technologies. According to an Oireachtas PQ response provided last year by the Government, “AR/VR is a new disruptive technology impacting on many verticals and as a result it is difficult to scope the numbers of companies involved and the corresponding employment levels albeit a significant area of opportunity for Ireland.” More recently there were a number of successful immersive technology projects in the first round of successful applications under the Government’s €500m Disruptive Technologies Innovation Fund. The eco-system for immersive technologies in Ireland spans large international players such as US-founded industrial smart-glass manufacturers, and software solutions provider, DAQRI who have a significant presence in Dublin, to a raft of smaller indigineous companies who provide software applications to a growing base of users in key vertical markets such as engineering, medical, gaming, entertainment, education and training. A recent development has been the launch of a representative group for the sector in Ireland. Eirmersive aims to showcase the potential of the sector to both industry and Government alike, and is made up of a number of companies with solutions for both business and consumer end-markets. 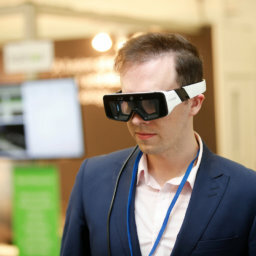 Against the backdrop of this expansion, this year’s ARVR INNOVATE conference and exhibition, taking place in the RDS, Dublin on Friday May 10th, will again offer delegates to hear from leading international and domestic speakers who will illustrate practical best-case deployment of AR and VR in business. In the enterprise and industrial space, there are a growing number of validated studies that show often remarkable impacts of the technologies in improving worker productivity and accuracy. A particular area of focus will be how remote assistance is now being facilitated by augmented reality. With the latest smart-glass technologies, companies are saving on travel by technical support in sectors such as engineering, oil refining, and telecoms by allowing them to assist remotely their staff in the field. A number of these remote-access providers will be exhibiting at the event. Training is predicted to be one of the largest growth areas for Virtual Reality in particular. The ability to virtually train employees in what would otherwise be hazardous contexts, such as fire training, is an obvious area for growth. US retail giant recently purchased 17, 000 VR headsets to be deployed in customer services training, including a Black-Friday simulation experience. This year’s conference will feature a number of speakers, and demoing companies, with a focus on this dimension of immersive technology use. The ARVR INNOVATE conference recently was listed in the Top 30 international immersive technology conferences and as well as attracting Irish delegates, has welcomed a growing number of overseas visitors, including an official delegation from Immerse Liverpool. This year the Augmented Reality Enterprise Alliance will partner with the conference to run a dedicated panel discussion on using AR in Enterprise contexts, addressing the challenges at both boardroom, manager and employee level to faster deployment. Keynoting at the ARVR INNOVATE conference this year is Dean Johnson. As an accomplished design leader, writer, presenter, BBC tech pundit and former Head of Innovation at Brandwidth, Dean Johnson is shaping the connected future for Film, TV, Automotive, Publishing, Music, Education and Leisure sectors with the emphasis on user experience and engagement. Other speakers include the AR and VR global leaders for Audi and Medtronic who will outline how user adoption of the technologies can be facilitated. A new feature of this year’s event will be a TU Dublin Open Labs workshop where attendees will be able to explore the practical workflows of developing an augmented reality experience in a case-study context.